Why GB Racing? GB Racing products are the clear benchmark in high-performance, bolt-on motorcycle protection for the short circuit, road racing and street bike community. GB Racing is the only company to have received FIM product approval from 2009 through to 2020 on its range of bolt-on non metallic secondary engine covers, along with MCRCB, FFM, IDM, AMA/MotoAmerica, CIV, IDM, FFM and World Endurance approval. WGP products also have two patents granted: Improved Composition (Patent #GB2479405) for the material used in our engine protection and a patent for Reverse Wear Indicators (Patent #GB2532535). 3D Design Each product is specifically designed, engineered and manufactured to deliver the best overall quality protection. Our core product range is our FIM-approved bolt-on secondary engine covers. We vary the injection-moulded material thickness, from 2mm to 12mm to give maximum engine protection without compromising ground clearance or weight. What is the difference between STOCK and KIT engine covers? The STOCK refers to the stock casings, as you would see on your bike in the showroom. The KIT refers to factory (HRC/YEC ) casings, normally the alternator cover, where race teams would purchase factory alternators that produce minimal charging of the battery, to reduce inertia and therefore increase performance. Therefore, the KIT alternator cover is designed for a kit alternator casing which has replaced the standard casing. 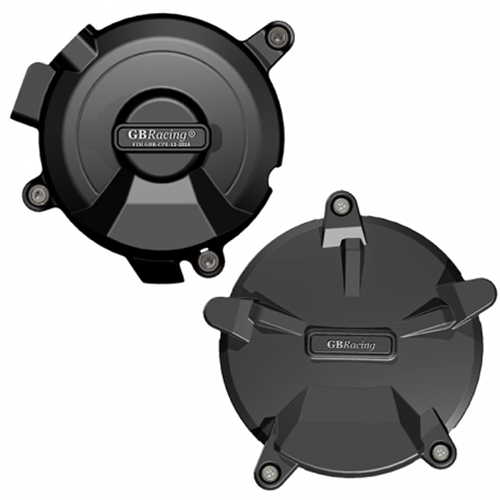 Alternator/Generator Cover The GB Racing alternator/crank covers are designed to provide the best protection to your motorcycle's alternator. Designs that fit either the standard stock casings or the factory race kit alternator covers. The alternator is located on the left hand side of your motorcycle. All covers come supplied with replacement bolts. There is no need to remove stock casings or gasket seals. Clutch Cover The GB Racing clutch cover will provide protection and style to your motorcycle's clutch. This clutch cover is fitted over the existing clutch on the right hand side of your motorcycle. All covers come supplied with replacement bolts for your clutch cover. There is no need to remove stock casings or gasket seals. Timing/Pulse Crank Cover The timing crank cover is located on the right hand side of your motorcycle. The timing cover is usually the smallest of the set. Once again, all covers come supplied with replacement bolts. We highly recommend using the timing cover with the clutch cover for maximum protection. There is no need to remove stock casings or gasket seals. Water Pump Cover In some cases the water pump is in a vulnerable location and, when required, are included in complete sets.